What did you do to stop Donald Trump? Only two days left of this “surreal, miserable” presidential election campaign, to quote the New York Times. A “catastrophe” is looming, should Donald Trump win. What did you do in this year to stop this “ignorant and reckless tyrant,” the paper adds. “The United States has seen worse than Donald Trump. It has endured political crises and corruption, war abroad and bloodshed at home. But that doesn’t make it any easier to contemplate the catastrophe that looms if we wake up Wednesday morning to President-elect Trump. There’s no sense complaining anymore. The hurricane is three days from landfall. The urgent thing now is to avert the worst, minimize the damage, save the foundations, clear the mess. Averting the worst starts with electing Hillary Clinton. For many voters that will mean defying Republican efforts to jam the electoral machinery through lies, legal obstructions and the threat of violence. We hope the voters hold out, however intimidating the process and long the lines. For Americans who may feel unmoved or unwilling to vote for Mrs. Clinton, here is a question from the future: In 2016 we were closer than ever to electing an ignorant and reckless tyrant — what did you do to stop him? It is a history of coded race-baiting combined with myopia and cowardice that puts the Republican establishment in lock step now with the alt-right, the Ku Klux Klan, the racists and misogynists and nut jobs, the guy who shouts “Jew-S.A.,” the crowds that scream, “Lock her up.” For some it is taxes, abortion or immigration, for many it is simply Clinton hatred that allows them to justify supporting a candidate who also stands for torture, reckless war, unchecked greed, hatred of women, immigrants, refugees, people of color, people with disabilities. A sexual predator, a business fraud, a liar who runs on a promise to destroy millions of immigrant families and to jail his political opponent. If Mr. Trump is rejected on Tuesday, the nation will have a momentary breather. And some good news to build on. The Republicans who have spent the last weeks and months jumping on, then off, then on the Trump bus will have been discredited, and some may be unseated. Those in the Trump inner circle will be freshly disgraced, and perhaps go away — like Rudy Giuliani, former New York mayor, now Mr. Trump’s conspiracy ghoul, and Gov. Chris Christie of New Jersey, who has been separately brought low in an unrelated courtroom drama. And the electorate will have demonstrated its decency. The rejection of Trump is the simple part. Win or lose, the harder job will be confronting the conditions that spawned him. This country’s problems will still be deep and complex, and the Republicans in Congress show no signs of giving Mrs. Clinton any more respect than they gave President Obama, or of abandoning their jihad against responsible governing. If she wins, Mrs. Clinton will have the burden of managing the jihadis, while governing for the benefit not only of her supporters but also of the tens of millions who will have voted for Mr. Trump expecting — against all evidence — that he will make everything better. It won’t be easy. As an immigrant and a recent citizen, I will cast my first presidential vote in November. I have looked forward to this for quite a while although this sad, even depressing, campaign hasn’t been the kind of campaign that I had hoped for. And my choice is clear: Hillary Clinton — Trump’s America is not my America. Today, on Labor Day, I realized that all is not doom and gloom. At the traditional Labor Day Parade in Kensington, the next town over from my home town of Silver Spring in the Maryland suburbs just north of Washington, DC, thousands had come out in the beautiful weather. There was excitement and optimism in the air; good people are running for office, among them my Congressman, Chris Van Hollen, a Democrat who is running for the U.S. Senate to succeed retiring Barbara Mikulski, and State Senator Jamie Raskin, also a Democrat, who is trying to succeed Van Hollen in the U.S. House of Representatives. Their campaigns are important parts of this year’s overall political campaign and their outcomes are almost as important as the race for the White House in determining what kind of America we will have after November. 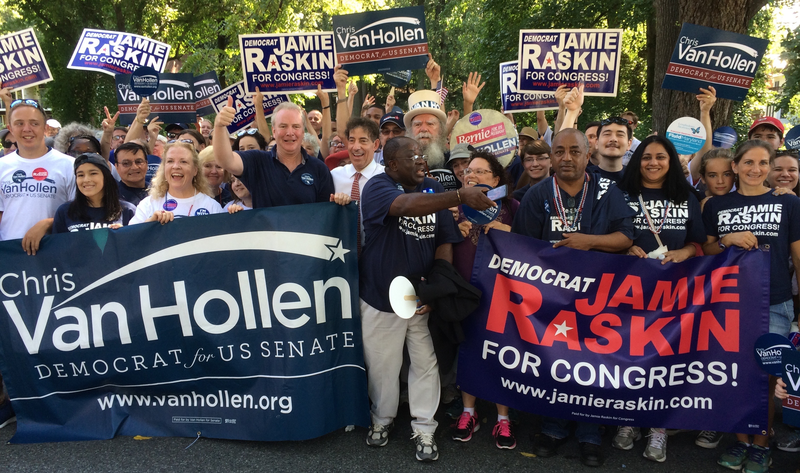 Van Hollen and Raskin both handily won their respective Democratic primaries in April and their victories in November, although not guaranteed, of course, are highly likely in this Democratic state. Van Hollen, the son of a foreign service officer, was born in Karachi, Pakistan. A progressive with lots of foreign policy experience and knowledge, he has been in Congress since 2003 — the top Democrat on the House Budget Committee, and part of the Democratic leadership team. Raskin, a law professor at the local American University, has been in the State Senate since 2006, where he has been a leading voice on many liberal issues: marriage equality, repeal of the death penalty, gun control, climate change, medical marijuana, campaign finance reform. They are smart and hard-working and their hearts are in the right place. They will be great additions to the U.S. Congress, which, god knows, needs all the help it can get. I once thought that the American presidential election was going to be a battle between Hillary Clinton and Jeb Bush, between the country’s two legacy families, the Clintons and the Bushes. I am still right, at least so far, that Hillary Clinton will be the Democratic nominee. In fact, I believe so now more than ever after her spectacular victory yesterday in South Carolina, capturing over 73 percent of the vote and over 80 percent of the African American vote. She simply trounced Bernie Sanders, and I believe this pattern will repeat itself in the primary contests in the slew of Southern states, also with large and important African American constituencies, on Super Tuesday in two days. And, then, the race is more or less over. But, obviously, I was wrong about Bush. His legacy did not carry him for long, or really not at all, as his candidacy whimpered out after only four primary contests, in Iowa, New Hampshire, Nevada, and South Carolina. He was a bad campaigner, almost pitiful, and although he tried to stand up for what the Republican Party used to stand for, he had no chance in the toxic climate created by Donald Trump, the GOP’s “Frankenstein monster,” as foreign policy expert and Brookings Institution scholar, Robert Kagan, writes in a scathingly critical article of his old party in today’s Washington Post. For Kagan, a former Republican, the only choice in November is to vote for Hillary Clinton, as the “frantic efforts” within the Republican Party to stop Trump have failed, according to a report in today’s New York Times. There was talk of the “Republican establishment” stopping Trump, but who is that and where is it? No, it now seems too late to stop Trump, as all the polls on the doorstep of Super Tuesday point to many more victories for the New York businessman.